Maker Cred: Okay, so. I have a longtime friend that had moved away from our hometown first. 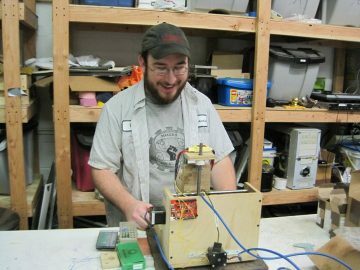 He moved to Nashville and got really involved with something called a “Hackerspace.” The then brand new Hacker Consortium. He had tons of fun building projects and learning new skills. When I moved to Huntsville in 2008 He encouraged me to meet these people at a place called Makers Local 256. He absolutely insisted that I’d love it. They were holding their second ever open house, so I went, and I like to say that I never left after that day. Area of Expertise: I’d like to consider myself a “Jack of all trades”, but I have done a lot with electronics hardware, amplifier and filter design, creating PCBs, and soldering anything and everything (even teaching some classes). I’m also something of a computer history buff, with a collection of old computers and game systems. Many of you may know the van-load of things I bring to our Retro Gaming and Computing Nights. On the side, I quite enjoy little woodworking and programming projects. Current Projects: The big events for me in 2017 are buying a house and getting married, so I’ve had much less time for my traditional “projects”. I do get to have a lot of fun bringing some “maker” flare to my home and wedding planning. I do have my “next” big project lined up though. I hope to build my own home-brew Z80 computer. I’m inspired in part by my collection of 8bit computers, and finding the book “Build Your Own Z80 Computer” by Steve Ciarcia. I’m excited that a project like this will be a great exercise in learning more about how microprocessors work, and I’m hoping that I can continue to try to make PCBs and such for progressively more modern system. Favorite Shop Event: Well, I’m clearly biased because I helped to start and run Retro Gaming and Computing Night. I think it’s so much fun to re-play old games, celebrate the systems that got us where we are today, and to introduce those bygone things to the next generation of makers. Talk to Him About: I’m generally happy to talk about most anything. However, I’m likely to be the most verbose about computer history, GNU/linux, 3D printing, or my home state of New Hampshire (Live free or die). Great article! Very proud of my son and everything he does. And truly, he doesn’t have a bellybutton. Way to go, Timothy Miiiii-cheal. And I’ll vouch for the belly-buttonless-belly (proud auntie here)! Super photo and article. Do you live in Huntsville or close? We will visit in October but sadly can’t attend your wedding. We will be in AL 10/13 for a couple of days, maybe 3. Mike only has 2 weeks off of work.